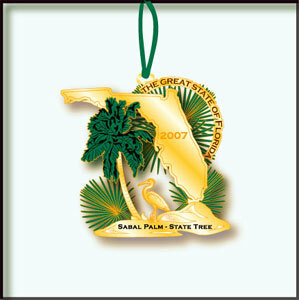 The graceful fronds of Florida's State Tree, the Sabal palm, frame the classic Florida scene featured on the 2007 Governor's Mansion Collectors' Limited Edition Ornament. The Sabal palm (Sabal palmetto) is the most widely distributed palm in Florida, as it grows in almost any soil and has many uses, including food, medicine, and landscaping. The 1953 Florida legislature designated the Sabal palm as the state tree, and in 1970 replaced the cocoa palm on the state seal. A stunning 24 kt. gold finish graces this beautiful ornament.